Every now and then, when browsing older issues, you come across something that raises an eyebrow and seems to beg the simple question: What were they thinking? The scenario below, while not particularly politically correct, is hardly cause for indignation, but you have to wonder whether there is any scientific basis for the ability to smell a person’s ethnic background (though I should mention that one of my co-workers, with a relationship record that spans almost every continent, claims that you can). And while we’re on the topic of “weird,” what’s with Matt pawing this guy’s face to begin with? For those who are curious, this panel is from Daredevil #224, written by Jim Owsley, in his first of two guest writer appearances, and penciled by Daniel Jurgens and Geoff Isherwood. 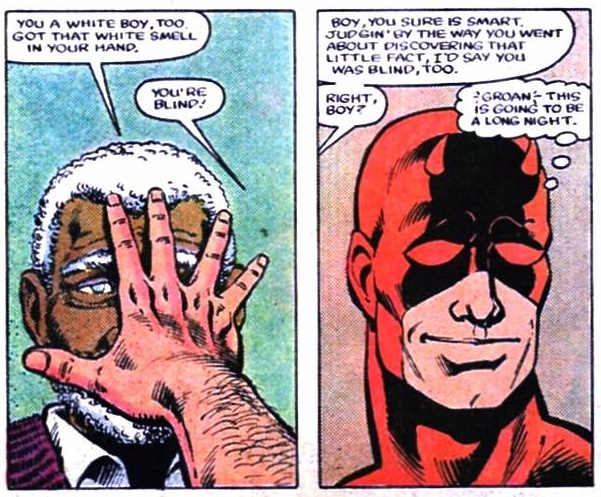 The older man in this picture is Abe, for whom the issue is named, and comes into contact with Daredevil when caught in the cross-fire between some baddies, and the two spend much of the issue at a diner together. I can smell white people too, I thought everyone could? How curious! I've heard it said somewhere that white people smell of sour milk to those from the far east due to the amount of dairy produce westerners typically eat. I hear the Hulk smells like pork.